CityVerve, made up of a consortium of 21 partners including Manchester City Council, MSP, University of Manchester, etc., was all about showing how technology could improve the lives of all Mancunians by helping gather and share information in new and exciting ways as the UK's first smart city demonstrator. The City of Firsts campaign set out to engage with the people of Manchester and build awareness of the two year CityVerve project by capturing the city’s imagination and getting people talking about the amazing things taking place within their city. But rather than flooding our audience with technical jargon as had previously been the case, we wanted to create a more emotional connection by creating a sense of pride in the city that stemmed from its pioneering past right up to the smart city revolution that it leads today. The hero piece of our campaign was a short film by the name of “Manchester: City of Firsts”. It pays homage to the inclusivity of Manchester, the people responsible for the city’s pioneering innovations, and those who continue to make the city an inspiring place to live, play and do business in. It was a piece for the city, by the city, and instilled local pride in all it touched. We also integrated our characters on our newly designed website experience the film drove to, tying back to each element of the campaign telling a complete integrated story. 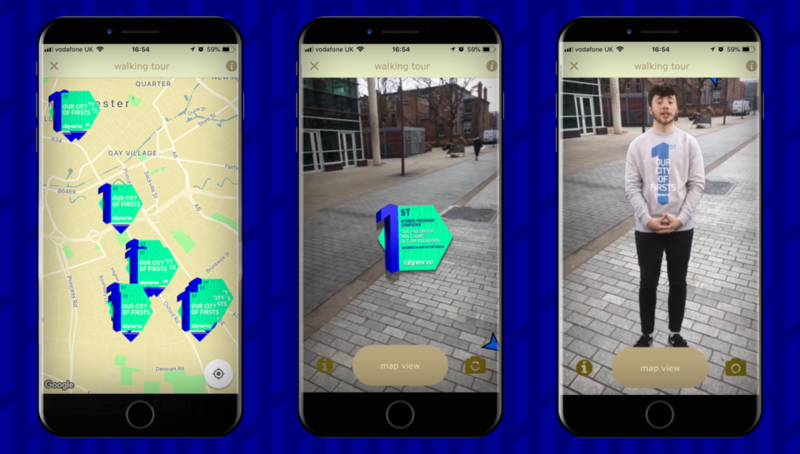 We partnered with one of the CityVerve SME partners, Sparta Digital, to create a first-of-its-kind augmented reality walking tour of Manchester’s innovation district. The tour included 15 points of interest along the Oxford Road Corridor, highlighting the many firsts Manchester has produced. Stops on the tour included use cases from the CityVerve project like the first connected building alongside revolutionary moments in history, such as the invention of the first stored-program computer and the founding of the Suffragettes movement. Each one was brought to life by augmented reality local tour guides. The points of interest were marked around the city by colourful bespoke plaques. In keeping with the theme of firsts, I went to a friend at Pentatonic with an original idea around how we produce the plaques who helped bring the concept to life and produced them for us made of up-cycled CDs and DVDs, reflecting Manchester’s rich history in music and media which had never been done before and supporting a circular economy and low carbon footprint for the campaign. A crucial part of building a truly smart city is empowering its residents to thrive in an increasingly digital age. To support this belief in Manchester, we also created a free online CityVerve digital skills academy for the citizens of Manchester as part of the campaign. Anybody with access to the internet is now able to make their way through six self-guided, Cisco-certified courses that cover topics ranging from the Internet of Things to cybersecurity. We also partnered with the historically famous Manchester Central Library to offer free computer access to anyone to complete the courses for those that don't have adequate connections at home (another challenge being addressed by a future Cisco Innovation project). Hear more about each campaign element on the CityCast podcast episode we did about the campaign here as well.